The Suffolk University Theatre Department will remount "At Ease," its original play about the American veteran experience, as part of Boston’s first Outside the Box summer arts festival. The productions will play The Modern Theatre, 525 Washington Street in Boston's theater district, July 13 - 14. Performances are free and open to the public. To create "At Ease," Suffolk University Professor Caitlin Langstaff matched seven campus veterans with seven actors. The students spent time getting to know one another and taping interviews that would eventually turn into monologues. As the monologues developed, so did relationships between the actors and vets. Suffolk senior Gabby Womack joined the production hoping to gain insight with her own brother and uncle, both veterans. She has had trouble connecting with them because they don’t like to dwell or even discussion their deployments. Suffolk Theatre major and Army veteran Jim Mihelidakis understands the difficulty in reliving those experiences. He has wrestled with the concept of readjustment and wonders if being a soldier will be a lifelong part of his identity. He commented, “When you’re used to seeing signs every day in a war zone that say ‘Complacency Kills’ it’s impossible to not be changed by that, not to lose your ability to be carefree." 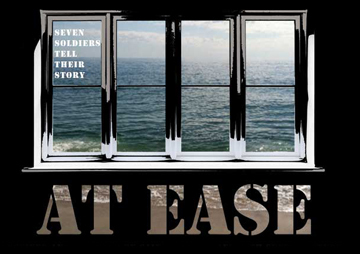 "At Ease" has been a cathartic experience for Mihelidakis, who's had trouble opening up about his experiences in Iraq. The safe communication space Langstaff fostered among the students became a major factor in this transformation. Although tickets are free, reservations are recommended and may be made at www.moderntheatre.com. Donations will be accepted at the door to benefit a scholarship for academically qualified students who are veterans of the U.S. military or descendants of U.S. veterans. The scholarship was created in 2000 by Suffolk alumni and World War II veterans John J. McCarthy, BSB ’49, and Michael Linquata, BSB ’50, who attended Suffolk University on the GI Bill.